It's perfect for charging your iPhone, iPod, AirPods, Apple Watch, and battery pack all at once. We live in age in which we have to tote around multiple electronic devices and almost all of those require some kind of USB-charger. If you’re like me, you’ll sometimes struggle to find enough outlets when you’re in a place where you need to charge them all. 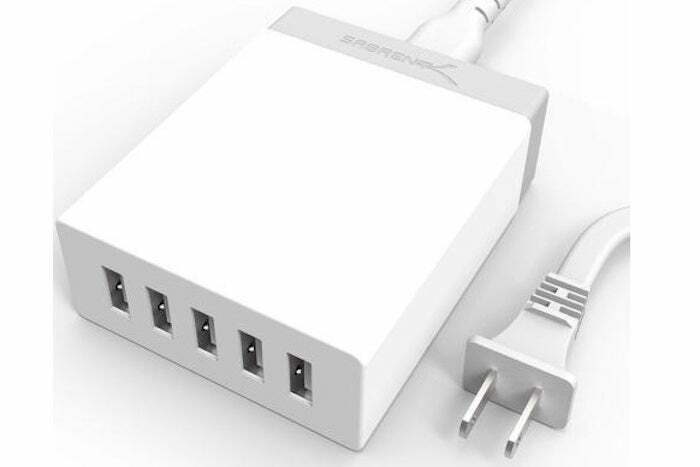 That’s why five-port 50-watt USB rapid wall chargers like the Sabrent AX-U5PW are so darn cool. And today on Newegg, you can get it for just $7.99 down from the usual price of $29.99. Yes, that’s a whopping 73 percent off. You don’t even have to pay shipping. Sabrent isn’t as recognizable a brand as, say, Anker, but it’s no slouch, either. Its listings on Amazon frequently rate four stars or above (out of five), and it achieves this even with thousands of user reviews. In fact, just yesterday we posted a deal for a Sabrent four-port USB hub that was so good that at least three of us on staff bought one for ourselves. With this kind of charger, you can charge your iPhone, iPad, AirPods, and an external battery pack all at the same time and still have room left over for something else. It charges at 50 watts with a total charging output of 10 amps (spread among all five ports at 2.4 amps per port). I personally don’t have this specific brand, but I use a similar Anker port here at my desk for this very purpose, and it’s nice to have everything charged up when I leaved for the day. I don’t remember what I paid for mine, but it was certainly more than $8. For more comparison, this charger is currently selling for $18.98 on Amazon. This is a fantastic deal, although it’ll only be around for a little more than four days (or while supplies last). But for this kind of charger at this kind of price? There’s no need to stop and wonder if you can afford it. Get it before it’s gone.